For years, some more skeptical analysts had been stumped by the relentless US consumer demand US for new cars, despite rising household debt levels, stagnant real wages, and concerns about record subprime exposure. Today, we may have found the dynamo that drove purchases to a plateau of between 17 and 18 million units over the past three years: pervasive dealer discounts and incentives. Almost all major manufacturers reported a sharp drop in U.S. deliveries for July, led by a 15% plunge at Nissan Motor. The reason: for the first time in 55 months, the auto industry - perhaps due to concerns about the impact of auto tariffs - cut back spending on incentives, snapping a streak of monthly consecutive increases that began 4 1/2 years ago, according to J.D. Power. While General Motors stopped reporting its monthly numbers earlier this year, Bloomberg reports that its sales fell 3.3% last month, the same drop as Ford. Fiat Chrysler, which recently lost its CEO Sergio Marchionne, was the rare bright spot in July, driven largely by a surge in Jeep SUV sales fueling the Italian-American company’s 5.9% jump. However, as we reported previously, both automakers could have used some positive headlines. GM lowered its profit expectations last week largely because of rising commodity prices, which have jumped since President Donald Trump put tariffs on steel and aluminum; meanwhile Jeep’s surprisingly weak performance in China - where subsidies for new auto purchases recently ended - was a major reason Fiat Chrysler dropped its forecasts for the year. As a result of underwhelming numbers from Nissan, Ford and Honda (and GM), the annualized industry sales rate slowed to just 16.8 million, from 17.2 million in June, and just barely above last year's selling rate. Fiat shares declined 2.2%, while GM fell 2% and Ford dropped 1.4% in New York trading. While generally expected, the drop in sales caps a rough month for the auto industry during which Detroit’s carmakers all revised their earnings guidance lower and Ford embarked on a five-year restructuring plan. 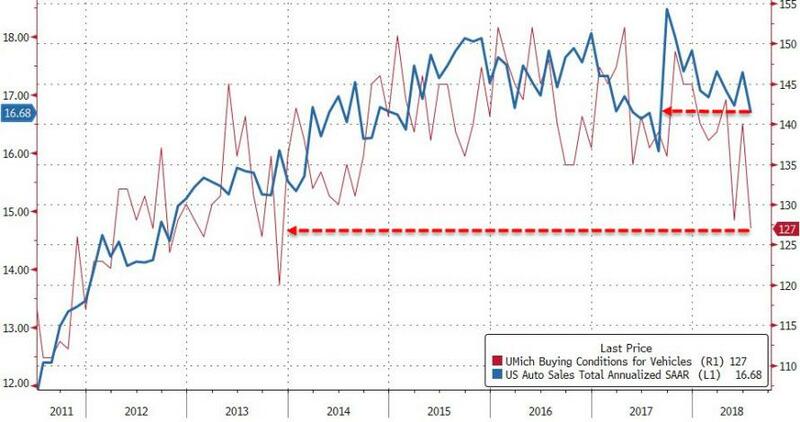 Additionally, as Bloomberg adds, the sales month "will underscore investor fears that auto sales have peaked and that, without ever-higher sales incentives to keep consumers interested, demand will continue to soften." The auto industry's reliance on incentives is troubling for several reasons: not only are they a profit "race to the bottom" as OEMs scramble to preserve and gain market share, but they may also indicate that without at least the impression that they are getting a good deal, many cash-strapped US consumers will be reluctant to purchase autos. Meanwhile, as the tariff picture remains murky at best, changing one day to the next depending on what Trump tweets at any given moment, auto makers will be reluctant to offer the same generous discount that drove sales for the past 5 years. 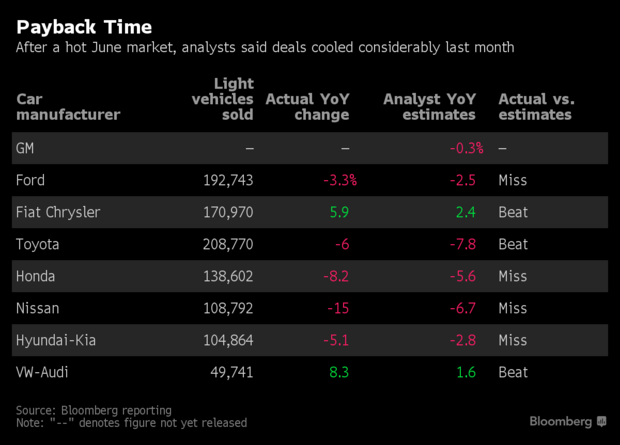 One possible explanation is that carmakers may have done their discounting early this summer and decided that enough was enough, even as July's results show some payback for promotions that fueled a better-than-expected close to the first half, according to Bloomberg. Not everyone agrees: "an incentive pullback is rare for this time of year", said Mark LaNeve, head of U.S. sales for Ford, which was hurt by steep drops for the Escape crossover and Fusion sedan. However, one clear reason for the pullback is that as a result of rising rates, it’s getting prohibitively expensive to offer incentives that are tied to loans. A series of rate hikes have pushed interest rates to levels not seen in a decade, which makes subsidized interest rates more expensive to offer. Charlie Chesbrough, senior economist for Cox Automotive, pointed out another possible issue: that while automakers are pulling back on new-vehicle incentives, there are great deals on used-car lots. Returns of vehicles that have been leased are on the rise, and that added supply gives consumers more choice of lower-priced alternatives to new models. “There is such tremendous competition from the used-car market,” Chesbrough told Bloomberg. “We have so many off-lease vehicles coming back to market and they are cheaper than new cars." Finally, there is the most likely reason: US consumers, dramatic upward revisions to the personal savings rate if only on paper notwithstanding, simply can not afford the extra dollars at a time when the prices of staples and other discretionary purchases are rising sharply. This, of course, is the worst case scenario because it means that even with record auto loans outstanding, many of which have crossed into subprime territory, Americans no longer feel confident enough in their financial future to make a long-term commitment. Which incidentally is precisely what the latest UMichigan consumer sentiment survey revealed last week, when it showed that vehicle buying conditions have collapsed to the lowest level in five years. WARD's Automotive reported a 16.68mm US auto sales SAAR for July - the weakest July sales since 2014 and set to go notably lower based on car-buying-sentiment. While bad news for automaker sales and profits, this is even worse news for the economy, as it confirms that the latest 4.1% GDP print is merely product of some overzealous excel jockey at the BLS who was told to goalseek a 4%+ number at any cost.